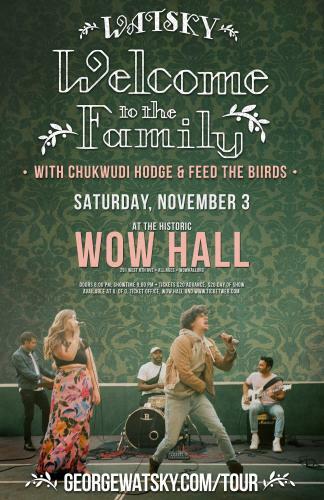 On Saturday, November 3, the Community Center for the Performing Arts and University of Oregon Campus Radio 88.1 FM KWVA proudly welcome Watsky’s “Welcome to the Family Tour” with special guests Feed the Biirds and Chukwudi Hodge. George Watsky is a rapper, writer and performer from San Francisco now living in Los Angeles. A versatile lyricist who switches between silly and serious, technically complex and simply heartfelt, George won the Brave New Voices National Poetry Slam in 2006. Immediate after, George appeared on the final season of Russell Simmons Presents Def Poetry in 2007 while a himself college Freshman; he subsequently performed at over 150 universities across the country. Rapping all the while under the name ‘Watsky,’ George self-released the barely-heard jazz-hip hop record Invisible Inc. in 2007 and the self-titled Watsky in 2010, which peaked at #7 on the iTunes hip-hop charts. In January 2011 George’s fast rapping went viral and led to two appearances on the Ellen Show, a slot on Last Call with Carson Daly, and an exploding online profile. George has performed at the Just for Laughs festival in Montreal, the NAACP Image Awards on FOX, three times at the Kennedy Center in Washington, DC, and has been featured in XXL, Billboard Magazine and the New York Times Magazine. Watsky’s social media presence made him one of only 23 artists dubbed by ‘The Next Big Sound’ as a ‘Big Sound of 2011,’ alongside Mac Miller, Kreayshawn and Skrillex. George graduated from Emerson College with a B.A. in “Writing and Acting for the Screen and Stage”. Now Watsky returns with his first new single in two years, “Welcome to the Family”. Chukwudi Hodge was born in Oakland CA, into the rich bay area culture of West African music. After beginning playing djembe at age two he toured with the West African Children's Dance Theater, and trained with greats such as Mosheh Milon, Riche Faye and Mamady Keita. While continuing to have a heavy commitment to traditional music, Chukwudi added drumset to his repertoire at age ten. Chukwudi honed his skill through the years, and landed his first band membership in 2006 with the GetBack at eighteen. He was accepted to the Berklee College of Music in the Fall of 2008, and attended full time for two years while still remaining very active with the GetBack. Hodge is the current drummer for lyricist George Watsky, and has played and learned with musicians such as John Blackwell, Youssou N'dour, Terri Lynn Carrington, and many more amazing drummers, musicians and artists. Chukwudi was the director of music curriculum at Nea Cummunity Learning Center from 2008-2013, when he moved to Los Angeles to tour full time. Tickets are $20 in advance or at the door (if there’s any left). Doors open at 8:00 pm and showtime is 9;00.